NEWS.... Archbishop of Canterbury installs Archbishop Bernard Ntahoturi in Rome ceremony during a ceremony at the Oratory of S. Francesco del Caravita on 26 October. Who are we? The Friends of the Anglican Centre in Rome are men and women, priests and lay people, the newly curious as well as committed ecumenists, young, old and everything in between. We hold a diversity of views on social, political, and theological positions, and have many different ways of trying to understand unity between the Anglican Communion and the Roman Catholic Church. Most of all, each and every one of us is committed to a dialogue between our churches that is never dull, that is alternatively frustrating and rewarding, and that’s always worth the effort. There’s an important conversation going on... and there’s room for you in it. Archbishop of Canterbury installs Archbishop Bernard Ntahoturi in Rome ceremony. Archbishop Bernard Ntahoturi was installed as the new director of Rome's Anglican Centre by the Archbishop of Canterbury, Justin Welby, during a ceremony at the Oratory of S. Francesco del Caravita on 26 October. Seeking to promote Christian unity in a divided world, The Anglican Centre in Rome provides a permanent Anglican Communion presence in Rome. Written to coincide with the 50th anniversary year of the centre, and offering an update to Frank Bliss's volume 'Anglicans in Rome', 'An Open Door' tells the story of the past 10 years of the centre and looks to its future. The book includes an appendix with the significant milestones of the last ten years and a brief historical record of the centre's 50 years. Archbishop Justin Welby and Cardinal Koch provide their own reflections in the introduction. 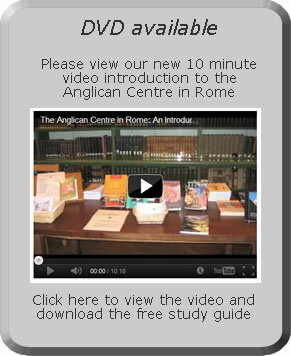 Matthew Davies, an editor at the Episcopal News Service, has released a video report on the Anglican Centre in Rome and St. Paul's Within the Walls. To view it, please click here. "First envisioned by Archbishop Michael Ramsey and Pope Paul VI to facilitate dialogue between Canterbury and Rome, the Centre fosters this work while also serving as a place of scholarhip and learning. The work of the American Friends has been an important factor in heightening the visibility of the Centre. I am grateful to all who contribute toward this and encourage you to become involved. May the work of the Centre continue to strengthen the church's ministry of reconciliation across the globe."